The sun relented behind the river bank, yet dusk’s glow did not bring cooler air. And despite the persistent heat, we positioned our seasoned chairs into a familiar ring. We were camping, so it wasn’t like we had much choice in the matter. Our faces were still flush from the day on the water, but we gathered in towards the glowing tinder that would bring out the stars. The logs swallowed oxygen and ignited into flames. We grabbed ice cold beers and our circle widened to temper the heat. We couldn’t help but find the irony in sitting around a fire in 100 degree heat. We were still drawn to the crackles by a power and ritual that can be described in so many ways. 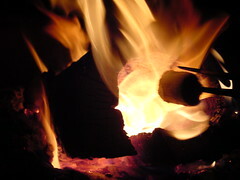 We reveled in the fact that people, just like us, have been sitting around fires since the day we harnessed it. Our ancestors’ ancestors did it, and our lineages will do it too. We dug into folding chairs and, amidst the glow, served up unrestrained conversation. In other words, hilarity ensued. I like to think that, around a camp fire, words are insulated with a sense of security drawn from centerpiece. Something happens, and part of me is okay with leaving it at that. Of course, like the white smoke drawn from an extinguished flame, all good things come to an end. One by one, the night took us from the ring, so that in the morning we had nothing but ash to remind us of our shared past. Well that and, just perhaps, another story to tell our kids the next time we find ourselves sitting around a burning flame. I too have memories of campfires, which are out ther with the remnants of your jokes and smoke. Thanks pop, I share many of those memories and stories too!